I’m working my way through the Dismas Hardy novels from Audible whieh are read by David Colacci – picky, picky. And although Hardy plays a role in The Suspect. he’s not the lead detective or lawyer – that role is taken by Gina Roake, a woman partner newly returned to firm. It’s considered a “stand alone” although it might be the start of a new series or #15 1/2 in the Hardy series – Hardy’s law firm is present in several persons. Anyway, it’s standard Lescroart in that Dr. Carolyn Dryden and her husband, Stuart Gorman are an up-scale San Francisco couple. He is the author of popular outdoors books while she is a pricey doctor. They have one child who has recently left for college and now Carolyn wants a divorce. But instead she is found dead, apparently murdered, in the hot-tub while he is away for a weekend at a cabin in the mountains. Stuart obviously did it according to the police but Gina certainly has doubts. And there are twists – no one is exempt from suspicion, even the daughter who was away at school but has serious emotional issues – manic-depressive or something. The case the police are building against Stuart builds in Lescroart’s brilliant fashion, yet Stuart is adamant he did not do it and almost insists on going without a lawyer. And then a serious detractor of Stuart’s writing shows up with threats – who knows? I stay up very late listening to these stories. The writing style in crime fiction almost always takes second place to the plot and the setting and character development take second place to the plot. Everything takes second place to the plot in a thriller. But this is not to say these elements are ignored – the San Francisco of Lescroart is definitely the San Francisco I know. 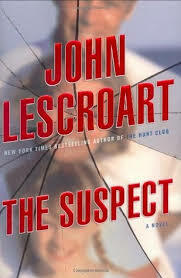 The main characters in Lescroart’s novels are usually believable enough and in The Suspect a couple of them are fairly complex. The literary elements in legal thrillers should not ever interfere with the suspense so it’s the unusual author who can do that at all – Lescroart is not one of them but mercifully he doesn’t try. His style, although sometimes uneven, never detracts from the flow of the tale. Lescroart writes good dialogue and that adds to the tension because it keeps the tempo. Do not be afraid of legal thrillers – these are the real who-done-its these days – far better , in my opinion, than those crime novels when you know who did it and only read to watch the chase. There’s not usually much actual violence in legal crime, those aspects are usually behind the scenes but still, legal thrillers are quite intense and there is often a chase or “close call” that’s why they’re “thrillers.” Some of my go-to legal thriller authors, along with Lescroart, are John Grisham (who has a new one coming this month), Adam Mitzner, Greg Iles and of course, Michael Connelly. One thing about crime novels is that they have to be realistic – readers look for that – inconsistencies or inaccuracies are a huge no-no. (And Lescroart was a wee bit sloppy in this book.) But they do crop up from time to time and Lescroart is no exception – how is it that Stuart has no idea how cell phones work when he’s talking to his daughter but scolds Gina for not knowing how they can be used by the police? – a little detail but that can be not only annoying but in some cases it can break a suspension of disbelief.